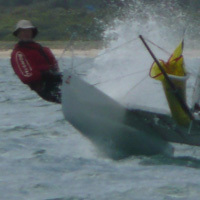 Register Log In Catsailor.com Forums Forums Mosquito Catamarans Get ready for the new season. What have you done to get your Mossie ready for the New Season? I'll start off, I've ordered a new Jib from Peter Dunk @ Alegayter Sails and am continuing to refine the new spinnaker sheeting system. little shop at the national Matt? You know there will be a 20% Mexican Tax payable to the SA committee. Last edited by Sixth Element; 08/23/16 03:59 PM. New spinnaker from Mr Irwin coming. Downhaul upgrade, replace a few lines, replace ball bearings in traveller. Already added new Irwin mainsail in winter. Maybe Matt's shop will have one...? I might replace a few old strings - and look for some fittings to take off the boat (always satisfying). I should also get a slightly longer spinnaker sheet and halyard (they both seem to have shrunk). Oh yes, and I must patch that little nick in the spinnaker. I'm looking forward to 2016-17 being the first complete season that I will sail without ever taking off the spinnaker gear. Same here, hope I won't have to take the Jib on and off as well. But the opposite to Tim, I think I have found more fittings to put on, adding to my major problem, rigging time. Maybe I just won't travel anywhere and leave it rigged at Paynesville all season.